Darrell, 71, lives in Chicago with his wife of 32 years. He is a US Marine Corp veteran who served four years in Vietnam. Darrell worked for years at the IL Department of Motor Vehicles, but has since retired. In his free time he enjoys exercising with his two dogs and spending time at the VFW and American Legion. Recently, Darrell developed health issues related to his heart. His physician recommended addressing his oral health concerns to prevent complications. Several of Darrell’s teeth were missing and many that remained were loose and decayed. He receives a small Social Security retirement benefit, which just covers his monthly expenses, and he could not afford the necessary dental treatment. It seemed he had nowhere to turn for help. 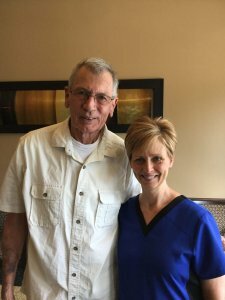 Fortunately, Darrell was referred to the Donated Dental Services (DDS) program and he was linked with two generous volunteers. • Dr. Cheryl Mora performed two deep cleanings, several extractions and donated upper and lower partials. • Dental Arts Lincolnshire fabricated the partials at no cost. Dr. Mora and her staff are great. Downright the best people I’ve ever met. Such a great program and I am very grateful. Illinois Donated Dental Services (DDS) is a program of Dental Lifeline Network, a national humanitarian organization and affiliate of the ADA, providing access to comprehensive dental care for people with disabilities or who are elderly or medically fragile and have no other way to get help. Close to 7,000 patients in Illinois have received treatment from over 800 volunteers. Learn more about volunteering or to learn about DDS in your state, visit our state pages.